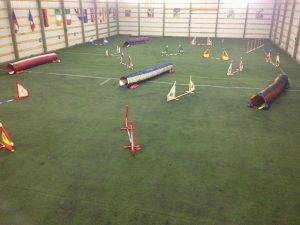 All of the dogs think the turf is pretty extra special – I don't know if it is the turf itself, or if it is because **I** am excited to go out and train and practice on the surface, but all of the dogs are pretty amped up. Anna is here, as well, from Germany, and that certainly brings up the level of excitement out in the arena – I have a training partner! With that additional excitement, as well as the long break in regular training, AND the change in surface underfoot, Chispa has lost her marbles. I'm so happy to see how excited she is to play, but I have had to take some HUGE steps back in how I approach working with her. Her running contact training, for example – while it was in the very early stages, there was SOME understanding of at least staying on the plank while heading toward the Treat & Train. When Anna and May are in the building? Nope. Recall? Nope. And, since the surface is now turf and not just dirt, I am also keen to keep accidents from happening. So, dogs need to potty before going into the building. …And….Chispa couldn't even bring herself to do THAT yesterday, when we finally got down to some training. So, stepping pretty far back. I gave up on a second round of training yesterday afternoon before we headed out to Thanksgiving dinner; she had to potty before going into the barn, and as she couldn't do anything other than bounce around and eat grass and try to make repeated breaks toward the building, she went back in her crate. The good news was that when we got home several hours later, and I suited up in my finest rain gear, and headed out to the potty area near the agility building, with Chispa on leash, I KNEW she would have to go. And, of course, she did. So, what *am* I working on with Chispa? I'm continuing to work on her running contacts – I haven't gone any further than the last video, because Anna and I discovered that she's basically incapable of doing anything on the plank when there is any chance of something happening in the arena (Anna moving around, May moving around). And, she can focus on me for a few moments at the far end of the arena, if Anna and May are running around, but after that she breaks off of me to go zooming over to check out Anna and May. She does come back, but obviously, not breaking off in the first place is critical. So, for now, I'll be continuing to work on her running contacts, and her tunnel/threadle behavior, when I get the chance to take her out alone to the Agility Hall. But, when there are other dogs or people in the mix, I'm going to keep things very simple until Chispa is more comfortable focusing on me when she's really aroused and there is exciting motion going on. This is nothing surprising; just about every dog I've had goes through this, and who can blame them? I'm almost always alone in the barn, and while Chispa has had Frodo running around as a distraction, it's not the same as a NEW dog or ALL my dogs, and milling around is also not as exciting to her as purposeful movement.